Music has changed almost beyond recognition over the last fifteen years. One of the biggest changes is how long it takes an artist to release an album. No longer do artists release an album each year. That was the norm during the late-sixties and seventies. Indeed, some artists released two albums during a calendar year. A few even released three albums. Nowadays, we’re lucky if an artist releases an album every other year. Suddenly, artists are spending two or three albums on album. Some artists spend longer on their supposed Magnus Opus, only to discover that music has changed and the album is no longer relevant. That has happened many times. Not to Rick Anthony, who recently, has been one of the hardest working musicians in Scottish music. Many people will know Rick Anthony as the lead singer of Scottish indie rockers, The Phantom Band. They were formed in 2002, and after numerous name changes, settled upon The Phantom Band. However, it wasn’t until 2009 that The Phantom Band released their debut album. By then, The Phantom Band had spent years honing their sound, and building a following. This they did the old fashioned way, touring the length and breadth of the country. However, by 2008, The Phantom Band were more than ready to record their debut album. Recording of what became Checkmate Savage took place at Chem 19 studios in Blantyre, where The Phantom Band and producer Paul Savage got to work. The sessions began in early 2008, and over a period of several months, Checkmate Savage began to take shape. Once it was complete, the album was mixed at Franz Ferdinand’s Glasgow studio. Only the was Checkmate Savage ready for release. Critical acclaim accompanied the release of The Phantom Band’s genre-melting debut album, Checkmate Savage. It was released on Chemikal Underground in January 2009, and reached number 181 in the UK album charts. Not only had The Phantom Band arrived, but a great future was forecast for them. That proved to be the case. When The Phantom Band toured Savage Amusement, each night, they were playing to sell out crowds across Germany, France, Ireland, Belgium, the Netherlands and Switzerland. The Phantom Band were enjoying the fruits of seven years hard work. However, they couldn’t rest on their laurels. So it was no surprise that The Phantom Band didn’t waste time, and returned to studio in early 2010. This time, the sessions didn’t run so smoothly. Fortunately, producer Paul Savage was able to steer The Phantom Band through these troubled waters. They weren’t the first, and would be the last band to experience the difficult second album. This was merely a blip. When The Phantom Band released their sophomore The Words followed in October 2010, praise and plaudits accompanied another swaggering album of rock. Suddenly, The Phantom Band’s star was in the ascendancy. Once The Words was released, The Phantom Band’s original drummer Damien Tonner left the band. After this, The Phantom Band headed out on tour, to spread their musical message. The tour began in early 2011, and lasted right through the summer months. After playing two shows in Glasgow in December 2011, The Phantom Band decided to enjoy some down time. This allowed each member of The Phantom Band to pursue solo projects. This was when Rick Anthony decided to finish his solo album. He had been working on it since 2005. To finish what became No Selfish Heart, Rick didn’t head to one of Glasgow’s top studios. Far from it. Instead, Rick eschewed Glasgow’s top recording studios, and took a different approach to recording No Selfish Heart. He decided split his time between his between two places. This included his flat in Glasgow’s West End, in the city’s artistic quarter and his parent’s house in rural Aberdeenshire. From a technical viewpoint, this isn’t ideal. Neither his flat, nor his parents house had the equipment that Chem 19 had. So this meant that his album would have a much more lo-fi and intimate sound. Listen carefully and you can hear imperfections like a piano stool creaking. However, the intimate and familiar surroundings brought out the best in Rick, and allowed an outpouring of emotion. Rick’s sensitive and pensive side shawn through. Eventually, after eight years hard work, No Selfish Heart, a true musical labor of love was completed. Now was time for Rick Anthony to dawn his alias Rick Redbeard. It’s akin to Rick Anthony’s alter ego. Rick Redbeard’s music is much more sensitive and pensive. Critics would remark upon this. When Rick Redbeard came to release No Selfish Heart, it made sense to release it on Chemikal Underground. After all, it was the label that The Phantom Band’s were signed to. Released in January 2013, No Selfish Heart was released to widespread critical acclaim. Superlatives were exhausted by critics in an attempt to describe No Selfish Heart. The music showed a very different side to Rick, and they liked. Indeed, the critics marvelled at No Selfish Heart. It may have been eight years in the making, but it had been time well spend. Now some critics began wondering aloud when the followup to No Selfish Heart would follow? Before that, The Phantom Band would release two more albums. The first of these two albums was Strange Friend. It was an album that marked a new new beginning for The Phantom Band. When recording of Strange Friend began, The Phantom Band’s lineup had changed. Drummer Iain Stewart had replaced Paul Tonner. Nor was there any sign of producer Paul Savage. Instead, Strange Friend was produced by The Phantom Band and Derek O’Neill. He also engineered Strange Friend with Paul Savage. Once Strange Friend was completed, it was released in June 2013. Just like their two previous albums, praise and plaudits accompanied the release of Strange Friend. Critics hailed Strange Friend the best album of The Phantom Band’s career. Buoyed by the critical acclaim that accompanied the release of Strange Friend, The Phantom Band were already making plans to release their fourth album, Fears Trending. There was a reason for that. The seven tracks on Fears Treading had already been recorded. They were recorded at Chem 19, during the same recording sessions as Strange Friend was recorded at. When Strange Friend was recorded, there were still seven tracks left. The temptation for many bands is to release a sprawling, epic album. However, often that doesn’t work. After eight or nine tracks, the listener’s attention wanders. So, it made sense to keep the other seven tracks in reserve. They became Fears Trending. When it came to choosing a title, The Phantom Band couldn’t resist some wordplay. They chose Fears Trending, an anagram of Strange Friend. It became The Phantom Band’s fourth album. Fears Trending was released in January 2015, and proved to be the perfect foil for Strange Friend. Listening to Strange Friend and then Fears Trending, is akin to seeing two sides of The Phantom Band. Critics realised this, and lavished praise on Fears Trending. It showcased a versatile and talented band, who were now one of Scotland’s most successful bands. Despite this, the members of The Phantom Band still found time for their various solo projects. In the case of Rick Redbeard, this meant sophomore album Awake Unto. It was recently released by Chemikal Underground Records. After recording two albums with The Phantom Band, it was time for Rick to return to his solo career. So he wrote eight new songs, and cowrote In My Wake with Andy Wake of The Phantom Band. Field Years was written by Rick and another member of The Phantom Band, Gerry Hart. These songs would eventually become Rick’s sophomore album Awake Unto. Rather than head into a studio, Rick recorded the ten songs at a variety of locations across Scotland. These recordings took place between 2012 and 2015, and feature understated, sparse arrangements. They frame Rick’s vocal as he breathes life, meaning and emotion into the lyrics to these ten poetic and cinematic songs. That’s why he’s been compared to Leonard Cohen and Bill Callahan, on what’s captivating and breathtaking album of music. Awake Unto. Wild Young Country opens Awake Unto. It’s a country-tinged, piano-lead ballad. As the piano plays, Rick delivers a poetic, heartfelt paean. “Darling darling how would you like to dance around with me, tonight as naked as when we were born in candlelight dawn?” Accompanying Rick is an underrated arrangement. Just drums, a picked guitar and slow, thoughtful drums provide the backdrop as he delivers what’s a needy, hopeful paean. Just a lone guitar accompanies Rick on In My Wake as the song begins to share its secrets. Again, there’s a poetic quality to the lyrics. However, here, they’ve a cinematic quality, as Rick paints pictures. Especially as he sings of: “prowlers wait in our wake, to see what we’ve made, and I feel the coldest wind of the winter blowing from my lovers side.” Later, Rick has transported the listener to the barren landscapes, and can imagine: “the fire roaring from the other side.” By then, just guitars and occasional harmonies accompany Rick on this atmospheric and cinematic songs. After Rick counts himself in on The Golden Age, a guitar and banjo combine. They usher in Rick’s vocal, as he delivers a joyous, beatific vocal. Especially as he sings to his lover: “we’re in The Golden Age, let’s stay in The Golden Age.” Almost defiantly, Rick sings: “the world can bare its teeth, but if we live for joy and let not grief and worry mar the hours we keep.”Joy fills Rick’s vocal as guitars, banjo and harmonies accompany him. Later, the rhythm section help propel the arrangement along, before a blistering guitar solo is unleaded. It adds the finishing touch to what’s a memorable, joyous and anthemic song. Understated describes the introduction to Unfound. A chirping acoustic guitar accompanies Rick on this contemporary folk ballad. Its roots can be found in traditional folk songs. A devoted Rick sings: “should you go to the dragon’s lair, I would follow you there, and should you never return from underground, I too will remain Unfound.” Later, Rick sings of: “a harvest of riches and lasting forgiveness, will rid us of your misery.” This adds to an element of mystery to a song which veers between a love song, to one that’s tinged with mysticism, mystery, drama and beauty. From the opening bars of The Night Is All Ours, it’s apparent that something special is unfolding. The song sounds as if it’s been penned by Angelo Badalamenti for a David Lynch film. Guitars reverberate, while strings slowly sweep. Soon, Rick is delivering a heartfelt croon. He’s accompanied by a crystalline guitar, probing bass and harmonies. That’s not forgetting the lush strings. They provide the backdrop for Rick as he croons: “darling the day belongs to servants of another song,..the night is all ours, me and my baby sing.” It’s without doubt the most beautiful song on Awake Unto. From the distance, the arrangement to Field Years draws nearer. The keyboard stem is played backwards. This works though, as Rick delivers a tender, thoughtful vocal. He long for: “a place to call my own, four solid walls made of stone, roof overhead happy.” Soon, he can imagine himself watching the changing of the seasons, and watching “wildflowers grow.”Soon, the listener can imagine and wants to share Rick’s rural idyll on another cinematic song. Slowly and gradually Get Blood (Friendly) begins to unfold. It’s a fusion of country and folk where Rick is joined by Josephine Anthony. They duet, while a banjo, drums, accordion and guitar accompany them. Rick’s found happiness and is happy with his life. Compliments abound, including some backhanded ones. This includes the line: “you ain’t so pretty but you’ll do for me, you’ve a sadness that only I can see.” Despite this, Rick wouldn’t change it for the world in this genre-melting paean. Yuki Onna is another cinematic folk song. Straight away, Rick is painting pictures as plays his guitar and sings of “a traveller walked the night alone, towards a distant fireside glow.” That was where he met a bewitching and mysterious woman. Or did he? “But in the morning she was gone-a ghost, a dream or something from the pure white snow he lay upon.” He’ll never know, nor will the listener. It’s just an acoustic guitar that accompanies Rick on What Fine People, as the song unfolds. Anything else would be overkill. Rick’s vocal takes centre-stage, as he delivers the lyrics. As he delivers the lyrics there’s a sense of sadness and melancholia. Despair and disbelief are omnipresent as he sings: “what a fine fine people we are, robbing these graves from afar.” Accompanying Rick, is his trusty chiming guitar, which frames one of his finest vocals. He breathes life and meaning into his lyrics. Closing Awake Unto, is Let It Rust. Chiming, meandering guitars and rat-a-tat drums usher in Rick’s vocal. Soon, it’s joined by percussion, ethereal harmonies and a bass. By then, memories of childhood have come flooding back. Suddenly, reality strikes. He wasn’t an “idealistic youth.” “When I was young I never did anything.” Instead, “my friends and I had dreams of living without dreams-running like a wolf pack through the trees, and then as gliding birds, we surrendered to the breeze.” That was then. Now life is very different. Rick compares it “to that old hotel, where you’d go to hate yourself.” Gone are any hopes and dreams he once had, as a defeated Rick delivers his vocal. Later, it’s replaced by a wash of swirling guitar, chattering percussion and lysergic harmonies. They add to what’s a poignant and cinematic tale where reality strikes and Rick is forced to face the truth. It’s another of the highlight of Awake Unto. 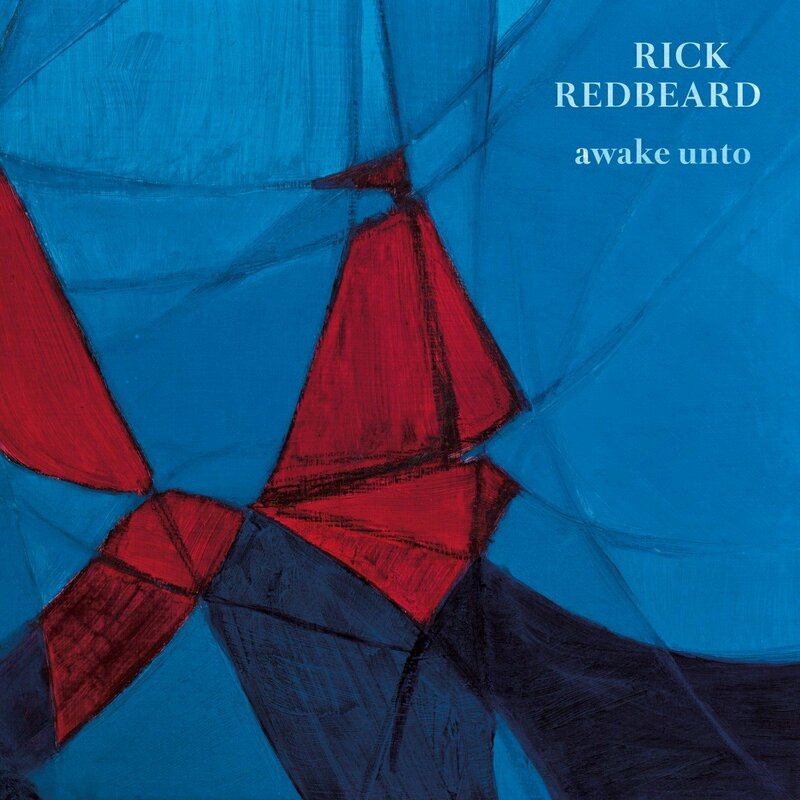 Three years after the release of No Selfish Heart, Rick Redbeard recently returned with his sophomore album Awake Unto. It was released by Glasgow based Chemikal Underground Records. Awake Unto is an album where Rick Redbeard has come of age musically as a solo artist. Awake Unto a much stronger and more cohesive album than No Selfish Heart. Rick Redbeard spent three years carefully crafting the ten songs on Awake Unto. With the help of a few musical friends, Rick has wrote and recorded Awake Unto between 2012 and 2015. These songs were recorded at various locations across Scotland. However, many of the songs on Awake Unto have much in common. Not only are they beautiful, but they’ve a cinematic quality. Rick Redbeard paints pictures with his lyrics, and with his unique and unmistakable vocal, takes the listener on a musical adventure. Although beautiful and cinematic describes many of the songs on Awake Unto, others are poignant, atmospheric, and tinged with drama, melancholy, mystery and mysticism. Other tracks are melodic and memorable, with The Golden Age best described as anthemic. Wild Young Country and Field Years are both heartfelt paeans from the pen of Rick Redbeard. He’s a talented songwriter, who has the ability to breath life, meaning and emotion into the lyrics. As he does this, he often combines musical genres. Mostly, though, Awake Unto is an album of folk music. There’s also diversions via country and pop, plus hints of rock and psychedelia. Awake Unto is also an album that’s the antithesis of most albums being released today. Nowadays, many albums being released are almost disposable. Not Awake Unto. Instead, it’s an album of cerebral music, that’s evocative, expressive, poetic and thoughtful. Rick Redbeard is a musical philosopher, the troubadour who sings of hurt and heartbreak, love and loss, life and death. Poignancy gives way to pathos, while there’s a sense of melancholia on several tracks. Especially as Rick reflects on his life so far on Let It Rust. Rick’s vocal plays an important part in the success of that song. That’s the case throughout Awake Unto. Most of the arrangements are acoustic. They’re understated and subtle. Despite this, the songs are intricate and multilayered. Subtleties, surprises and nuances await discovery from the opening bars of Wild Young Country, to the closing notes of Let It Rust. The ten carefully crafted songs on Awake Unto all tell a story, which is narrated by Rick Redbeard, Scotland’s latest troubled troubadour. ← DAN PENN-CLOSE TO ME-MORE FAME RECORDINGS.